In 2016, Russian engineers proposed the concept of a two-room airlock module, which would enable crews to conduct spacewalks outside the future international cis-lunar outpost. Using a pair of hatches with a diameter of one meter, residents of the outpost near the Moon could conduct assembly and repair operations, as well as installations of bulky hardware on the exterior of the station. Exterior design of the proposed Russian airlock for the International Manned Platform, IMP, in the lunar orbit as of 2016. During the final meeting in 2016 of the international working group on the cis-lunar station, which was held in Houston from October 24 to October 26, the Russian team presented the design of an airlock module to enable spacewalks from the outpost. The 4.6-ton spacecraft could also double as a cargo supply vehicle during its hitchhike ride to lunar orbit on the SLS/Orion vehicle around 2025. The Russian concept was based on the Airlock Module, ShM, originally proposed for the Russian Orbital Station, ROS, which was expected to succeed the International Space Station, ISS. The future module is essentially made of two airlocks -- the primary spherical chamber and a backup cylindrical extension. The spherical compartment with an internal volume of 16 cubic meters features two hatches for spacewalking cosmonauts. (For comparison, the pair of Docking Compartments on the ISS (SO1 and MIM2), which are used for spacewalks from the Russian segment, have a volume of 12 cubic meters each). The secondary cylindrical compartment of the future airlock would be normally used as a closet for spacesuits and remain pressurized, but it could also serve as a backup airlock itself in case of emergency, for example, if the primary compartment failed to re-pressurize at the end of a spacewalk. The crew would still use the hatches of the primary compartment to exit the station, but all the systems of the cylindrical compartment were designed to operate in vacuum. Such a backup airlock capability was previously provided by the Kvant-2 module on the Mir space station. 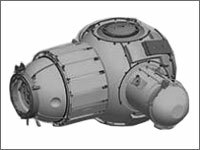 Traditionally for Russian modules, the airlock was expected to have docking ports on both its ends, which would enable it to serve as a pier and a vestibule for incoming spacecraft. To maximize the use of the airlock module as a delivery vehicle, a pair of three-tank clusters of the Rodnik (Spring) water system would be mounted on lattice structures attached to the sides of the spherical compartment. 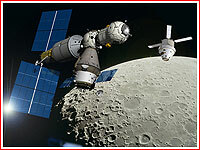 By the end of 2016, the international working group singled out the airlock module as the only feasible Russian component of the future cis-lunar outpost, not counting the Russian transport ship, which still remains in the early stage of development and without a readily available delivery system to the lunar orbit. Like most components of the cis-lunar outpost, the airlock module was slated to ride to the vicinity of the Moon on the Orion/SLS system. As of 2016, the mission was penciled around 2025 in the provisional assembly sequence of the cis-lunar station. Following the insertion into a trans-lunar trajectory, pilots of the Orion would separate their spacecraft from the upper stage of the SLS rocket, turn around, dock with the Russian airlock and then extract it from the stage. 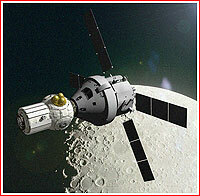 A few days later, the Orion would rendezvous with the cis-lunar outpost and dock with it via the airlock module. However the relatively low mass of the Russian airlock meant that the giant SLS rocket would fly not at its maximum payload capacity, losing a precious opportunity to deliver a full cargo to the lunar outpost. The problem could probably be resolved with stuffing the airlock with various supplies during its ride to the station. As an alternative, NASA engineers requested their Russian colleagues to consider launching the module on the Angara-5 rocket, along with its own space tug, which could automatically rendezvous and dock the spacecraft at the cis-lunar platform. Because the Russian airlock would be the primary "exit door" for the cis-lunar station (unlike the ISS, where the Russian and US segments have their own airlocks) NASA wanted to evaluate the option of integrating US-built spacesuits with the Russian airlock, along with the Orlan-type Russian suits. There were also discussions concerning where exactly to attach the Russian airlock to the station. Although, its two docking ports allowed to connect other components of the outpost at both end of the Russian vehicle, it would also mean that during spacewalks, the habitable volume would be split into two isolated parts -- not the best configuration from the safety point of view. Moreover, the central position of the module could create clearance problems for the arriving spacecraft and for the add-on components. As a result, the "open-ended" attachment of the airlock seemed preferable, but the issue remained to be resolved in 2017. Russian engineers also had to tackle the question of from which end to attach the module to the launch vehicle and how to organize the integration of the module with the station. 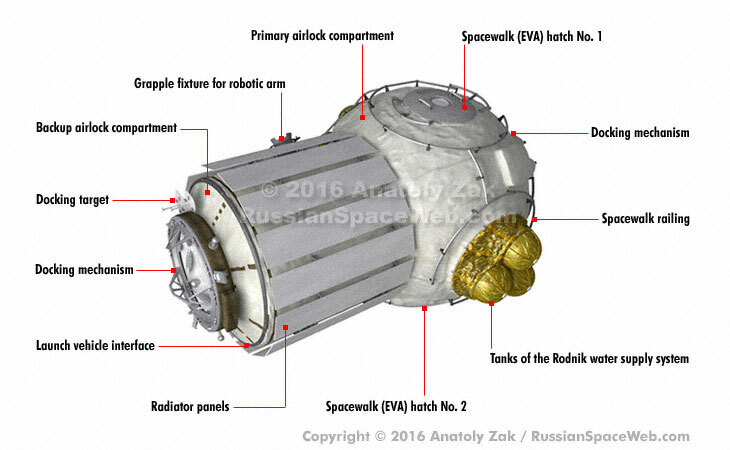 If the module was to be attached to the SLS via its primary spherical compartment, as it was originally designed for a ride on the Soyuz-2 rocket to the Russian Orbital Station, the Orion would have to dock it to the cis-lunar outpost in the "upside-down" position. The station's robotic arm would then have to be used to undock the airlock, rotate it 180 degrees and re-dock it back to the station. Alternatively, the airlock could be modified from its original design for the Russian Orbital Station in order to be attached to the launch vehicle via the aft bulkhead of its cylindrical compartment on the opposite end of the module. All these technical issues are yet to be dealt with, as the overall concept of the cis-lunar station continues to evolve.